Conan the Barbarian is a slot machine from Cryptologic with 5 reels and 9 pay lines. The theme in this slot is based on the old fantasy legend that was created by Robert E. Howard in 1932. The character has been seen in several different film and tv shows over the years, including the very popular 1982 movie which had Arnold Schwarzenegger as Conan. The slot machine has a great bonus feature – the Cave of Skulls Feature and this can bring you a fortune if you’re lucky enough. Conan the Barbarian gives a great impression and will surely entertain all players that enjoy the fantasy theme and the excitement of spinning the reels. This slot machine is very detail in the design of the symbols and characters that appears on the 5 reels. There are a lot of symbols that moves and activate certain sound effects in certain reel positions. The sound effects and the music bits that are added, here and there during the game, is pretty dramatic. The overall impression is a great slot machine where all components are in consistency with the main theme. The card deck symbols, 10 to Ace, are the lower paying symbols in the slot machine. Apart from them, you will see character symbols which are taken from the original comic book. The wild symbol in this slot machine is Conan himself and this symbol will substitute for all other symbols except the scatter symbol. The scatter symbol is the Conan logo. If you hit three or more of this symbol, you will activate the Cave of Scull Feature. The Cave of skull Feature takes you to a game window where you have to pick skulls in order to reveal the prize and the multiplier. The feature is terminated once you have picked a skull which doesn’t reveal a trap instead of a prize. This feature is triggered by hitting 3 or more scatter on the reels. There are also 9 Crazy Jackpots in this slot machine, one for each pay line. 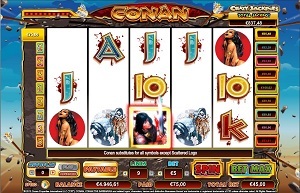 You will win this jackpot by hitting 5 Conan symbols on a selected pay line. Conan the Barbarian has 5 reels and 9 pay lines for you to bet on. The minimum bet per line is 0.05 coins as the maximum bet per line is 5 coins. The auto play function is located in the lower left part of the game window and is easily mastered to suit your gaming preference. « More slotmachines guides Article last updated: Tuesday, June 12, 2012.